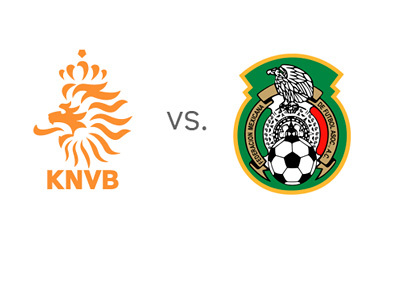 Netherlands and Mexico will play in the FIFA World Cup Round of 16 at Estadio Castelao in Fortaleza on June 29th, 2014. The kickoff is at 13:00 local time. Netherlands stormed through Group B, beating Spain, Australia and Chile, scoring ten goals along the way and conceding three. One of the most memorable games of the tournament so far is their 5-1 thrashing of former champions Spain in the first round of games. Arjen Robben and Robin van Persie are the two standout players so far for the Oranje with five goals between them. Mexico finished second in a Group A which also featured Brazil, Croatia and Cameroon. After beating Cameroon 1-0 and holding Brazil to a goalless draw, Mexico showed their fine form in a match vs. Croatia which they won with the score of 3-1. Guillermo Ochoa, the team's goalkeeper, is one of the players of the tournament so far. His saves in the game against Brazil were legendary. Netherlands are the favourites according to the odds. The Sunday's game is a battle between a strong European side stacked with great players and a Latin American side whose greatest strength lies in their unity. Could be a good one!